Bamboo & Green Tea Soap and Candle Set (P/N 16568). Preserve the environment with this eco..
Crafted from natural bamboo to balance wine and hors d'oeuvres at once, the handy-dandy Snack&tr..
Barrel Stave Wine Flight Set (P/N WINETF-IWA). Gather friends and family for an evening of win..
For any and every wine lover, this tool set features the finest in wine accessories including a blac.. Blood Orange and Syrah Liquid Soap (P/N LSBLS). The Napa Soap Company crafts their products in.. Display your wine with style! This playful wine holder works with all standard wine bottle shapes. 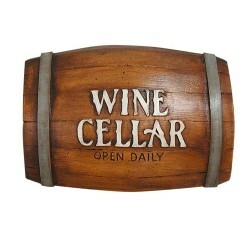 ..
Rustic Wine Bar sign personalized with your name and holders for 4 wine bottles. Size: 23.5 x 15.5&q.. Your dog will get in the "SPIRIT" with a mini barrel dog charm. Don't let the St. Bern..
co-Candle In Bottle, Bordeaux-Fig & Vetiver (P/N EG01). Made in the USA, our eco candles use soy..
Eco-Candle In Bottle, Thyme & Olive Leaf (P/N EG05). Made in the USA, our eco candles use soy wa..
Eco-Candle In Bottle, Verbena & Lemongrass (P/N EG06). Made in the USA, our eco candles use soy ..